I can't believe this is an actual post that I'm writing in 2011, and not just a hilarious prank that's being played on the River City Ransom fan community (...such that it is, anyway. Fun fact: Solitaire has more fanfiction on FanFiction.net than River City Ransom. Yes, that Solitaire.). my headline might’ve come across as kinda gross. 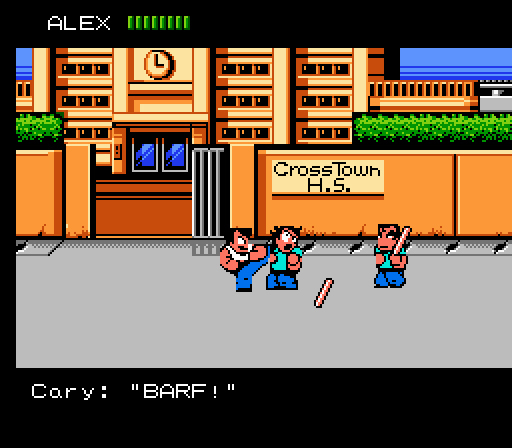 I can’t believe this is an actual post that I’m writing in 2011, and not just a hilarious prank that’s being played on the River City Ransom fan community (…such that it is, anyway. Fun fact: Solitaire has more fanfiction on FanFiction.net than River City Ransom. Yes, that Solitaire.). you loved that movie. how could you turn your back on it like this?!? Is there no honor left in this world?!! Evil pyromaniacal monkeys, and scientists who perform experiments on still-twitching severed heads? Yup, it's a horror game!